Almost ready for Open Studio! 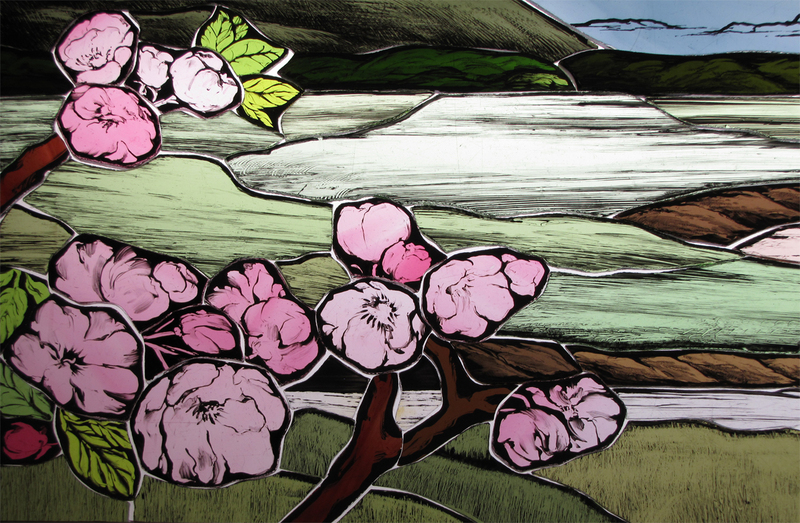 Everyone is welcome to come and see work-in-progress on my stained glass window for Trinity Episcopal Church in Branford CT. Today I’ve been painting branches of apple blossom onto little pieces of pale pink glass. How to paint delicate apple blossoms? I use an uncontrollably trembling paintbrush, then smudge the petals with my fingers. 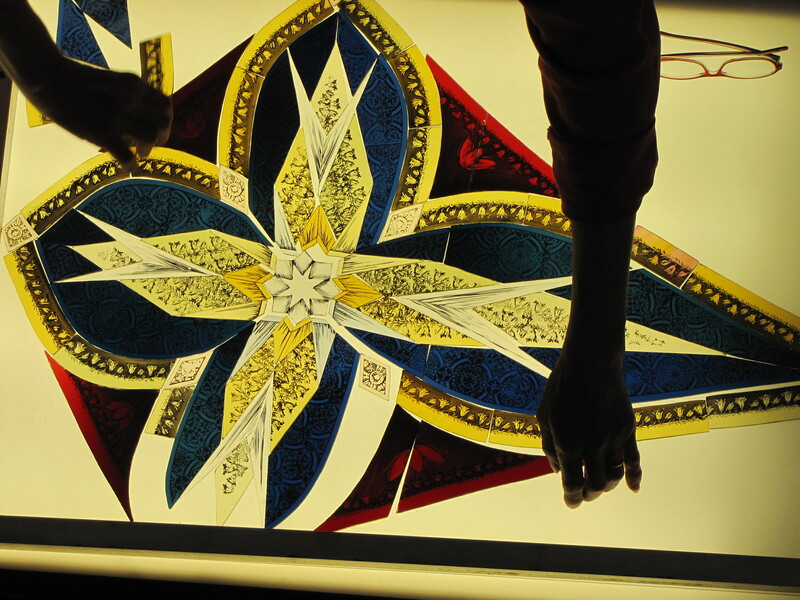 Here you can see the first layer of glasspaint photographed on a light table. Note that there are white spaces where the lead will go when the window is fabricated. 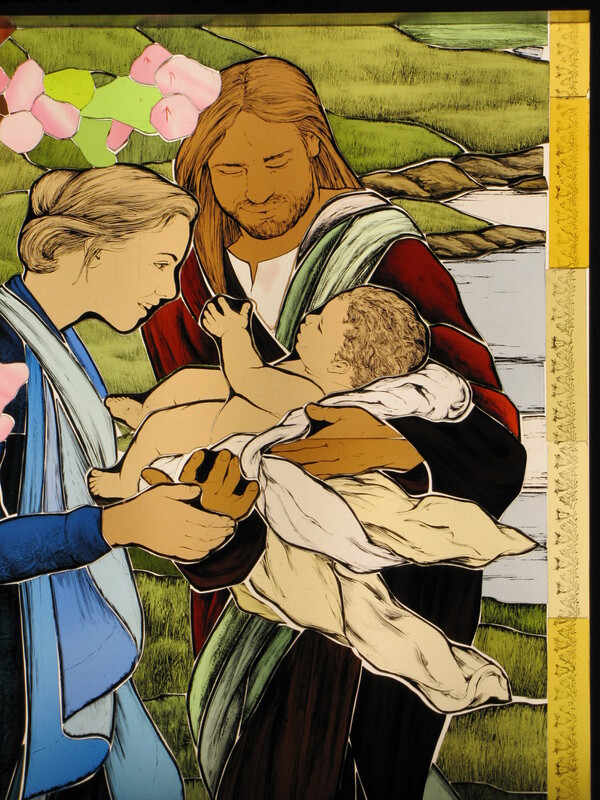 Tomorrow I will add more paint to the flowers, kiln-fire the glass for the second time, and fix the pieces onto my stained glass easel for viewing up against daylight. Come and critique my work-in-progress! Steady Progress on the top part of the window last week. Here’s the Star of Bethlehem. Painting salt marshes took up a fair old hunk of last week too. We tried to video the process of me actually painting this piece but could only capture 8 seconds at a time and don’t know how to join them together. Oh dear, where’s our son the film-maker when we need him! Here you can see the grassy areas in context behind the figures. I’m really enjoying glasspainting and it’s exciting to see the window progressing so well, but the photographs are horrible. The glass looks like paper cut-outs on the light table -no sparkle or movement. I’m really looking forward to seeing it against the daylight again soon. Hopefully I’ll have several panels waxed up onto the easel for my Open Studio visitors next weekend. 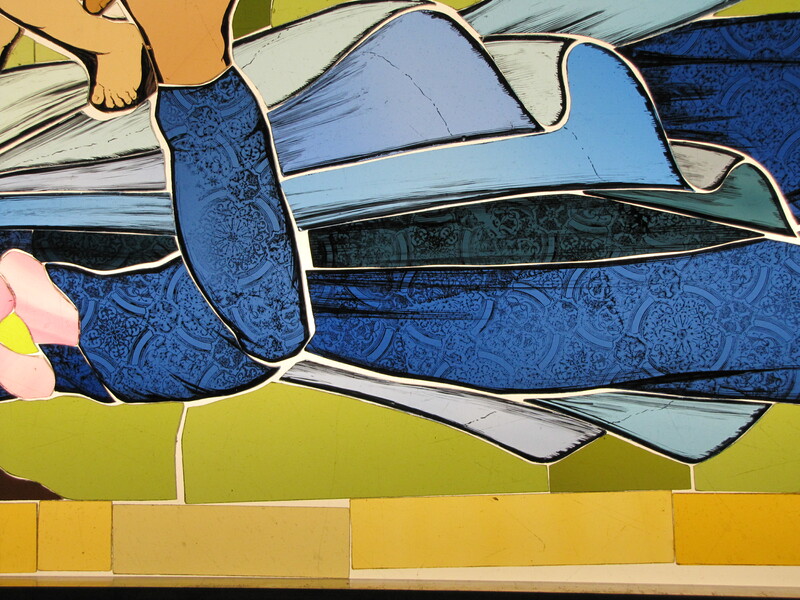 I’m also exhibiting eight of my Menfolk panels and will be demonstrating glasspainting. 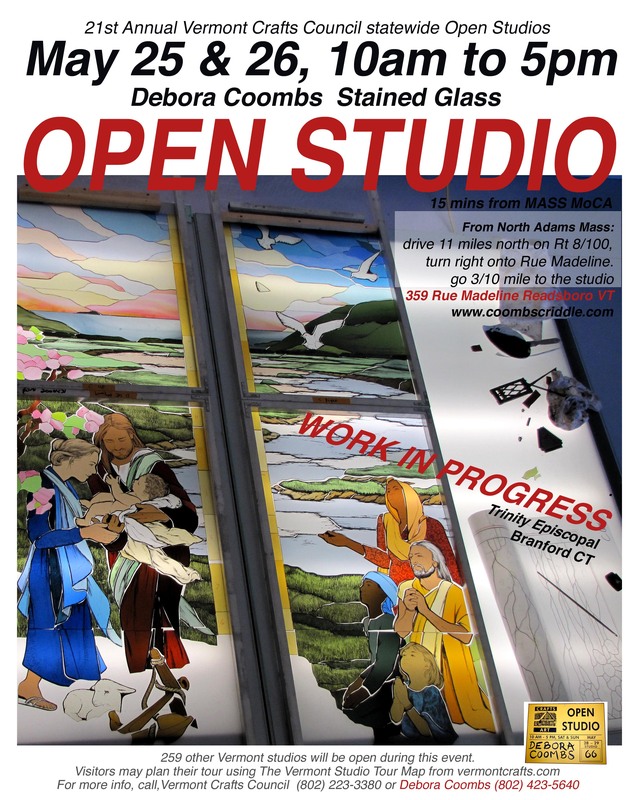 Open Studio is on Saturday May 25th and Sunday May 26th, 9am to 5pm each day. 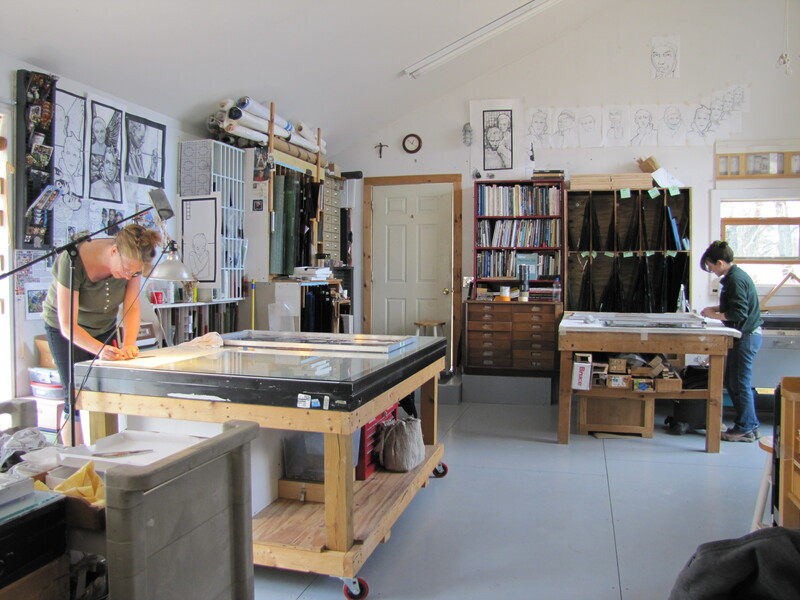 There are dozens of other artist’s studios to visit nearby, and hundreds statewide this same weekend during an event organized by the Vermont Crafts Council. Find out more, and 10 ways to plan you studio tour here and at the Vermont Crafts Council Spring 2013 Open Studio Tour webpage. Open Studio May 25th & 26th, 10-5. All Welcome! Everyone is invited to my annual Spring Open Studio on Saturday 25th and Sunday 26th of May. 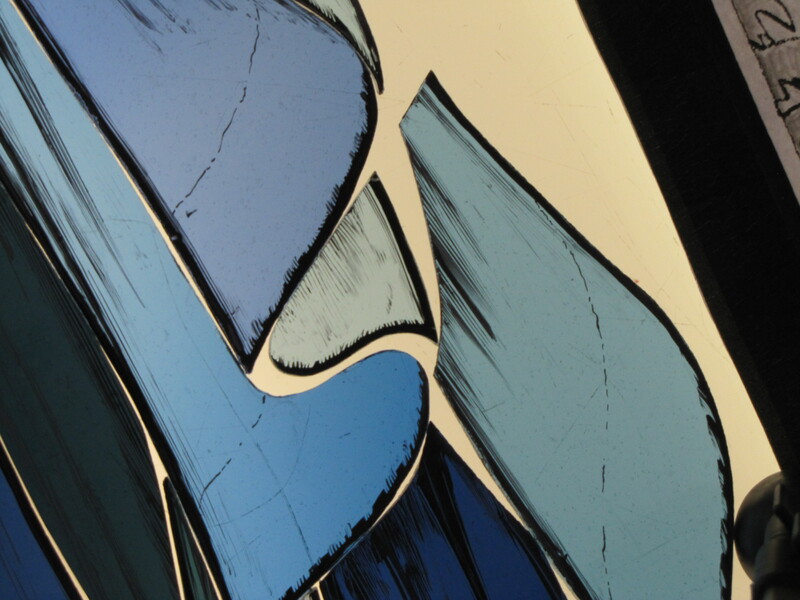 I’m hoping to meet some new stained glass lovers and to catch up with old friends. I wish some of you were nearer. I could host stained glass soirees like I did in London all those years ago. Here in Vermont I’m almost the only glasspainter for miles…. My husband calls Tracing ‘the Fred Flintstone phase of glasspainting’. I don’t think this is true of the faces, but I’ll agree, much of the rest of the window is pretty clutzy looking at the moment. My first two stages, Trace & Texture, sometime blur together somewhat. Notice the first layer of paint on the salt flats, these are heavily textured in the very first layer. 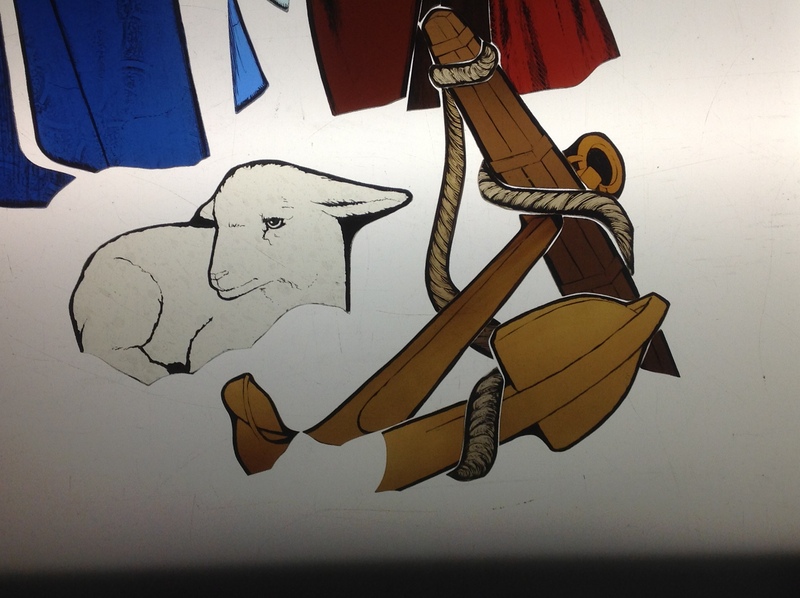 Drapery and objects are truly Fred Flintstone though, especially the lamb and anchor! I want my tracelines (the first layer of glasspainting) to be lively and energetic, with a sumi-like calligraphic quality. They must also be solid black in places, to hold their own against the leadlines. 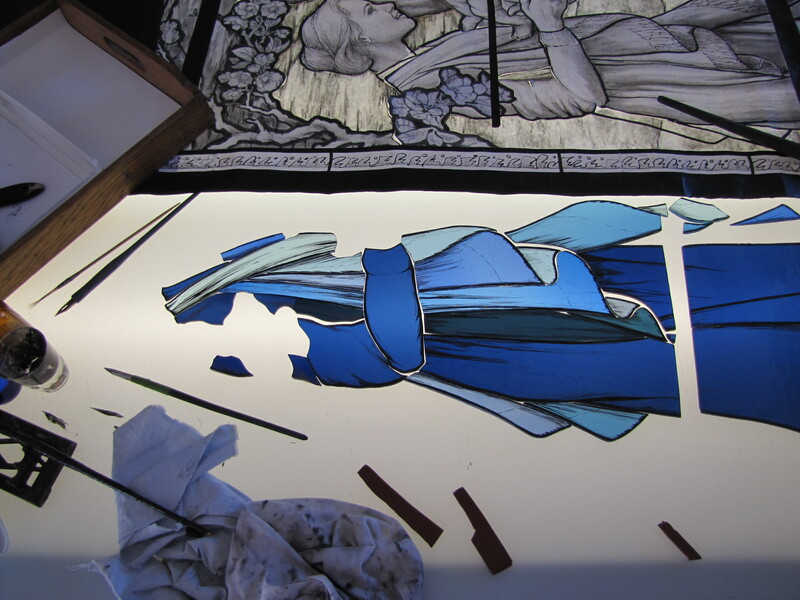 I flip between laying out entire areas of the window to visualize how it looks as a complete picture and taking it apart to work on individual pieces or sections. Notice in my last post that I painted the faces separately using very precise drawings as my reference. A few days ago I started working on the drapery which needs to be painted as interconnected pieces. Here’s Mary’s drapery, painted directly over the cartoon with a long fine-pointed squirrel hair quill and hand-made rubber combs. Leadlines are essential. 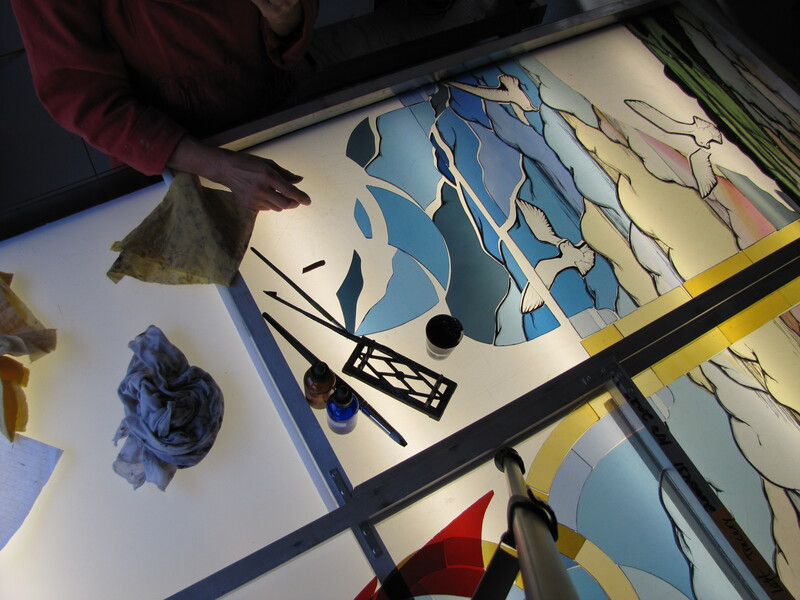 They provide visual strength for a stained glass window, and they hold it together. But they’re pretty clumsy, without any of the delicacy or finesse of a painted line. Generally speaking, I want them to disappear. I want the viewer to become engaged with the story portrayed, not the method of construction. 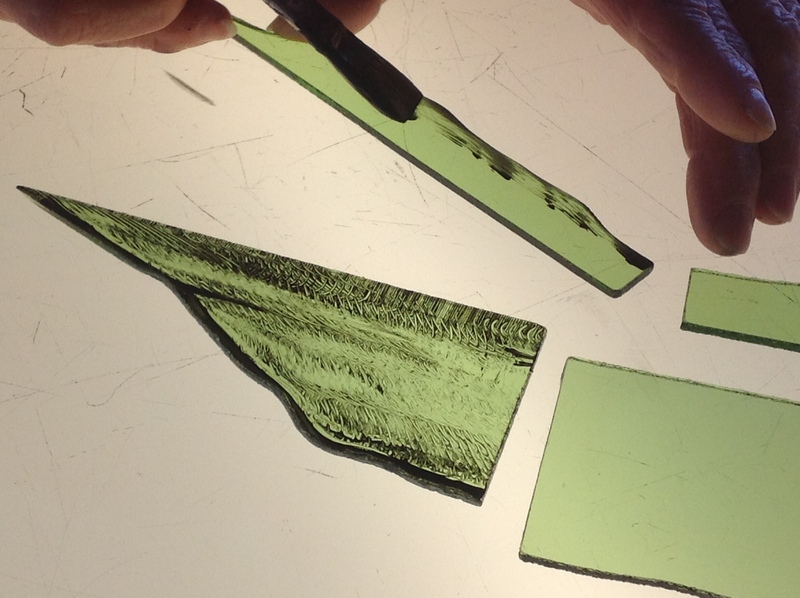 To this end, some pieces of glass have very little paint on them at this stage, but what is there is important. Oftentimes, it defines the edge of an object (leaf, hand or riverbank perhaps) because the leadline itself is too crude to do this. In places where there is no traceline bordering the edge of the glass there will be shading (texture and/or matting) instead. Again, I’m working on individual pieces whilst holding an image of the whole picture in my mind. In some cases, tracelines serve as a guide for subsequent layers of paint, like placeholders. These allow me to create a fresh interpretation of my cartoon, a translation rather than a copy, with all the bits in the right places. Notice the very fine squiggly lines parallel to the hem of Mary’s shawl. These show me where the decorative border will go. There’s also a very fine fringe at the bottom edges of the fabric (where glass meets lead) to indicate the direction. The last thing I did today was to apply pattern to Mary’s dress. I will be brushing away areas that will later become highlights (it’s not yet fired) and adding shadows in other areas in subsequent layers. This is the ‘texture’ stage of my glasspainting sequence. 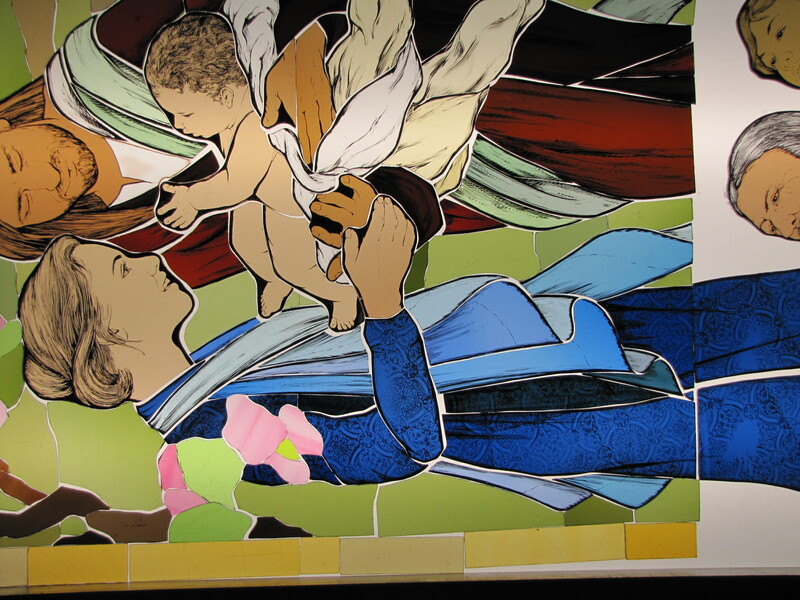 My first layer of glasspainting (the ‘tracelines’) went on to the Holy Family yesterday. I finished with the head of Mary. You might notice that there are gaps in her hair (e.g. none at the nape of her neck). I stopped because her hair was flowing so beautifully I didn’t want to smudge it. I’ll finish these areas at the next stage of glasspainting (before the 2nd firing), the one I call ‘texture’. The glass is photographed lying on the light table in one of my transparent bottomed trays. Notice how flat the colour looks -very different from the lively subtleties you can see when the glass is fixed to the easel. 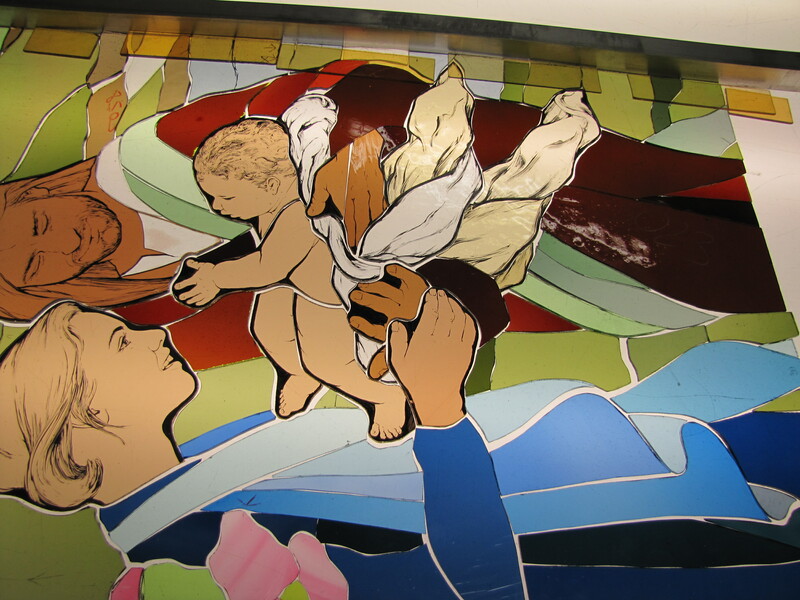 I have developed a unique method of glasspainting that allows me to maintain this sparkle in a fully painted stained glass window. You’ll see more photos as the project progresses. Or you can jump ahead for a sneak preview via these two short films, Menfolk Part 1 and Menfolk Part 2. 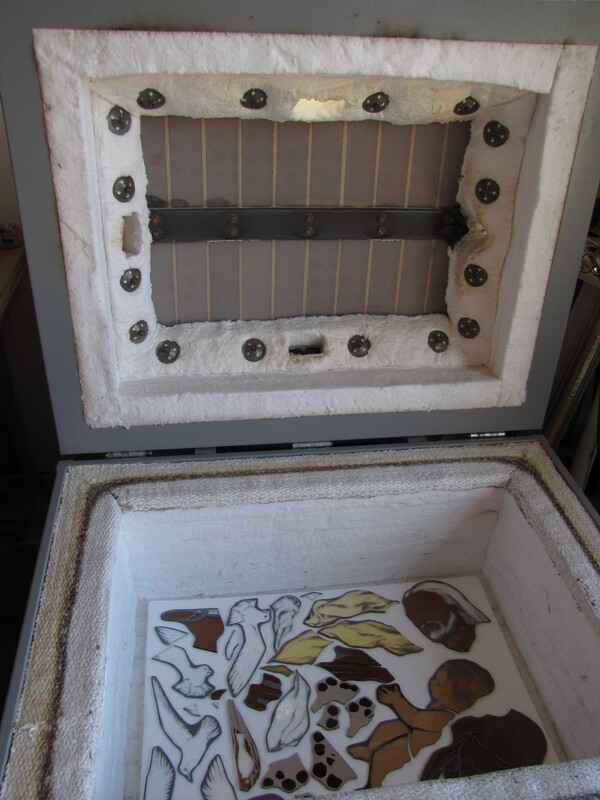 Here’s the first kiln load ready for firing. My trusty assistants, Sam and Cynthia spent today removing glass from easel plates and carefully grinding every single piece (somewhere around 1,200 of them) to match the cutline exactly. Thankyou both! To Karen, Sam & Hassan: regarding silver stain questions, the expert here is Ken Leap. You can purchase his thoroughly researched and informative book about silver stains online here. To Douglas: The bottles contain propylene glycol and water for the thinning stage of my proprietary glasspaint mixture. Read the story of how and why I developed this method and download my Student Notes for FREE from my Resources page. Thanks Ann, Sylvia, Christie, Hassan, Sherry, Lorraine, Doris and everyone else for your enthusiastic comments and interest. It makes blog posting a worthwhile endeavor!